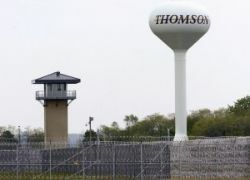 The Bureau of Prisons has announced renovations will commence on the Thomson maximum security prison in Illinois. The funding was approved in January in the Omnibus Appropriations bill for Fiscal Year 2014. The "state of the art" unoccupied state prison was built in 2001 and purchased by the U.S. from Illinois as a possible place to house Guantanamo inmates when Gitmo closed. Then Congress killed the transfer of Guantanamo inmates to the U.S. This is the news we’ve been waiting for. The funding that the Bureau of Prisons reported to Congress today is a significant investment in the economic future of Northern Illinois,” said Durbin. Until then, the Justice Department will direct prosecutors not to object if defendants in court seek to have the newly proposed guidelines applied to them during sentencing. The Congressional Black Caucus is teaming with Harvard Law School to put on this program in Washington next week. The speakers are terrific. A bill introduced yesterday by Sens. John Morse, D-Colorado Springs, and Morgan Carroll, D-Aurora, takes a sweeping approach to sentencing reform by aiming to lower the degree and penalty of most non-violent crimes. Welcome news today in the Washington Post: The U.S. Sentencing Commission is considering alternatives to prison for non-violent, low level drug offenders as well as for some supervised release (parole) violators. The commission's consideration of alternatives to incarceration reflects its determination to persuade Congress to ease federal mandatory minimum sentencing laws that contributed to explosive growth in the prison population. The laws were enacted in the mid-1980s, principally to address a crime epidemic related to crack cocaine. But in recent years, federal judges, public defenders and probation officials have argued that mandatory sentences imprison first-time offenders unnecessarily and disproportionately affect minorities. U.S. District Court Judge Jack Weinstein ruled this week that juries should be told before they deliberate if a defendant is facing a mandatory minimum sentence. The 236 page opinion is available here (pdf). [Hat tip to Sentencing Law and Policy]. Via Sentencing Law and Policy, Hillary was interviewed by Vibe Magazine last weekend. VIBE: In your speech, you talked about having first, second, and third chances for children. In the last ten years the rate of incarceration of women has increased exponentially. I don’t think the average person realizes that it’s not 50% or 100%, it’s like 750% in the last thirty years. There are a disproportionate number of African-American men and women who are going to be released from prison with felony convictions. What do we do about that group of people who are effectively disenfranchised when they come out? CLINTON: Number one, we need to divert more people from the prison system. We have too many people in prison for non-violent drug offenses, which disproportionately impacts on the African-American community. That’s why I’ve been a strong advocate of eliminating the disparity between crack cocaine and powder cocaine [sentencing]. There may have been a reason for it 25 years ago but there isn’t any justification for it now. But it also means that in the prisons themselves, we’ve got to get back to the services that used to be there. Update: Here's the cert petition (pdf) filed today, which Prof. Berman quotes from here. They'd also welcome amicus briefs. A must-read article in the New York Times today about Sgt. Patrick Lett and his cocaine sentencing in Alabama. Law Prof Doug Berman of Sentencing Law and Policy, who is now representing Sgt. Lett pro bono, has lots more. Sgt. Patrick Lett, had served 17 years in the Army, including two tours in Iraq, and he had pleaded guilty in federal court to selling cocaine. It was up to Judge William H. Steele, a former marine, to decide how to punish him. “I don’t normally see people standing before me in uniform,” Judge Steele said. A bill introduced in Idaho to allow judges to depart below state mandatory minimum sentencing laws for defendants marginally involved in drug dealing will get a full hearing before the state's House Judiciary, Rules and Administration Committee. The bill is co-sponsored by three Republicans and one Democrat. Idaho now has 7,400 people behind bars. More than half of them are there due to drug-related offenses. The state has shipped about 500 people to other states because there's no more room in prisons in Idaho. Under the bill, judges could opt for shorter, treatment-focused sentences for addicts convicted of drug-dealing crimes, on the presumption that if they get clean they're less likely to re-offend. "Our prisons are pumped full. It would be nice to give judges discretion about whether to send somebody to prison or to some other treatment program. In reality, they're the ones that are sitting on the front lines, not the legislators who are making the laws." Another bill pending in the state would expand drug courts. Hopefully we'll see other states -- and ultimately the feds -- follow suit. Good news in the federal sentencing department. Guideline changes set to take effect November 1 unless Congress acts to ban them include a provision giving judges greater discretion in granting compassionate release for dying prisoners. A safety-valve provision for compassionate release for the dying is in the original sentencing law but it hasn't been effective. But advocates for inmates say the way the statute is actually carried out is anything but compassionate. Few terminally ill inmates are approved for release, and the bureaucracy is such that even when people are approved, they often die before they get out. The advocates also contend that prison officials have misconstrued the original intent of Congress and interpreted the grounds for release much too narrowly. Now, in a departure from the tough sentencing policies that it has legislated for more than two decades, Congress is poised to allow guidelines to go into effect starting Nov. 1 that would give federal judges much greater power to release federal inmates. Meet Sargent Binkley, an army vet currently facing twenty-plus years in Santa Clara, CA. His high school buddies are trying to publicize his plight and have set up a website. Here's his sad story. Sargent Binkley is a high school classmate of ours and West Point graduate who is currently facing twenty-odd years in prison for robbing a Walgreens under California's minimum sentencing laws. He used a gun (unloaded) and robbed the drugstores of only Percocet - no money, harming nobody. desecration at one point) and he spiraled down. Via Sentencing Law and Policy, I see that at the Democratic debate on Saturday night at Howard University, the candidates spent six minutes on sentencing reform and mandatory minimum sentences. Democratic Forum, the first of the All-American Presidential Forums broadcast on PBS and hosted by Tavis Smiley, addressed the issues of mandatory minimum sentencing and racial disparity in the nation's criminal justice system Thursday. Hosted at Howard University in Washington, D.C., the forum focused on crime and punishment as one of eight topics presented to the Democratic candidates. Rep. Kucinich first brought up the need to eliminate mandatory minimum sentencing when asked about the disparate rate of incarceration, because "We know who's serving those mandatory minimums." Several candidates addressed the need for reform of federal crack cocaine sentencing laws, including Sen. Joseph Biden, who this week introduced the Drug Sentencing Reform & Cocaine Kingpin Trafficking Act of 2007 which would eliminate the crack and powder cocaine sentencing disparity. The entire transcript is here and the sentencing issue portion begins here. You can watch the segment here. Shorter version: Kucinich has always seen the light. Hillary and Edwards have made major shifts in the right direction, kudos to them. Richardson disappoints and is the only candidate to evade the question. As to specifics, here's what each of them said.